Electro Beats with an Indian Flair. DJ A-SLAM has taken the electronic music scene by storm with his unique blend of mixing hard electronic beats with Indian influences. Accompanied by live dhol, his DJ vs Dhol show has spread to over 5 countries. His debut album, “Back Down”, was released in 2012. DJ A-SLAM’s talent and style has already garnered him respect in the industry, with his single “For You” winning an international Hip Hop/R&B songwriting award. He was also nominated for a Juno for the album he co-produced for Canadian R&B singer, Inez. He has proven his ability to get the dance floor bumping with his dynamic beats- opening for some of the industry's leading artists such as Jay Sean, Malkit Singh, Apache Indian, Fat Joe, Sweatshop Union, JoSH, Raghav and Aman Hayer. A-SLAM has toured across Canada with H-Dhami, Imran Khan, Juggy D and Mumzy and performed with Stereo Nation at the Rogers Centre in Toronto and with Des-C and Nasir Khan in Kuala Lumpur, Malaysia. DJ A-SLAM has brought his energetic beats to festivals across Canada, performing at the Canada Day celebrations in Ottawa, Desi Fest in Dundas Square and Diwali celebrations in Toronto. At home in British Columbia, his performances include the Torch run and other Olympic celebrations in Vancouver and Whistler, Victoria Mela, Harrison Folk Festial, the Vancouver International Bhangra celebrations, Kirtan Vancouver, Sawan Mela and the Dragon Boat Festival. 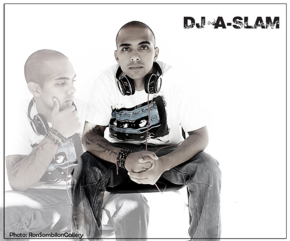 DJ A-SLAM is also apart of a DJ Production group, Global Party Starters. Their music often contains strong political themes, recently focusing on issues like domestic violence and the taboo of cross-cultural marriage. They received media attention for their music video "Gone" â€“ released on the International Day to End Violence again women and is based on a true story. You can read more about it in the CBC article under the promo section or by clicking here!